It’s noisy, dusty and polluted, the traffic is crazy and the crush of life chaotic, and most of the time I simply can’t get enough of downtown Kathmandu. But when sensory overload strikes, escaping the city and heading for the hills provides much needed respite and a breath of fresh air (….literally)! As it turns out you don’t need to go far. A gentle Saturday morning bicycle ride out of Thamel and in mere minutes the world opens up. High rises shorten, the traffic quietens and a verdant vista lures us on to Shivapuri Heights, just 12km away. Nestled on the edge of Shivapuri National Park, just close enough to enjoy the sparkling city lights, Shivapuri Heights Cottage provides a greener, cleaner location, teetering above rice paddies and surrounded by forested ridgelines dotted with gilded and white-washed stupas. As the base of it all we meet our host Steve Webster and load our bikes into the back of his 4WD for the impossibly steep climb to Shivapuri’s simply breathtaking viewpoint. We drop our bags and join Steve on a guided walking tour of the local Namkha Monastery where we slip off our shoes and step into the darkness, marvelling at intricate frescos that Steve interprets for us. Back outside, a rocky trail rises and dips past high village houses, goat huts and corn fields, returning us to the cottages in time for a hearty lunch served al fresco on Shivapuri’s outside deck. The spread is delicious and the views distracting, absorbing us until the monsoon rain sweeps across Kathmandu to meet us. We retreat inside to comfy lounges with mugs of steaming coffee and dainty bowls of fresh fruit to chat and read and unwind to cool tunes. More guests arrive, a lovely blend of expats and locals and tourists from around the globe, and conversations deepen over glasses of Indian chenin blanc and icy Gorkha beers. Early the next morning we wake to find tea and coffee waiting for us on our private deck, and spend time watching the light colour the world below before climbing the stairs for a fresh, flavoursome, two-course breakfast. We spend the morning on a scenic drive to nearby Dadagaun Village, hit hard by Nepal’s devastating 2015 earthquake, and tour the school that Steve and his wife Neeru support with funding and training. There’s a delicious Nepali feast waiting for us on our return, and I submit to an hour-long ayurvedic massage as the afternoon rains begin to patter on the rooftop. Providing the perfect fusion of hotel and homestay, Shivapuri Heights Cottage is far more than a top accommodation choice in Kathmandu. It’s proximity to Kathmandu’s top tourist sights – Pashupatinath Temple, Bodhnath Stupa and World Heritage Listed Durbur Square – make it an ideal base for discoveries in and around the city, but at day’s end this idyllic haven could be a million miles away. Quite apart from those perfect views, this rare find provides some of the best hospitality around, effortlessly combining good food and impeccable rooms with an easy, well-practised hospitality that comes naturally to Steve and Neeru. The food is plentiful and well presented, much of it locally sourced and some of it plucked directly from the property’s decades-old gardens. Two cottages (with 2 and 3 private rooms each) and more decadent rooms in the main Jasmin House cater for all budgets and group sizes. There are plenty of attentive touches: refreshing welcome drinks, arm chairs draped with shawls for chilly nights, filtered water at your bedside, and little essentials such as mosquito repellent, toiletries, and an oil burner prefilled with aromatic oil. Bookshelves in every room heave with intriguing novels and old-style board games for quiet time out, and the ultra accommodating team of local staff includes a massage therapist. It’s easy to fill a few days at the cottage. Steve and Neeru can arrange private or group yoga classes and a jacuzzi is currently under construction beside the massage room. Foodies can sign on for Neeru’s Nepali-inspired cooking classes and Steve, a professional tour guide, offers walks to Dadagaun Village, Namkha Monastery and beyond. 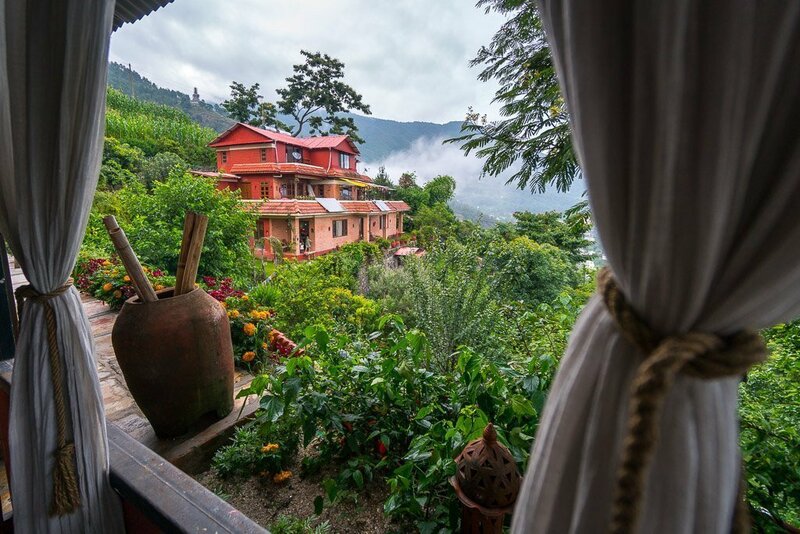 Located about 12km north of Kathmandu city centre, Shivapuri Heights Cottage (shivapuricottage.com) provides a range of rooms priced from US$110-170 twin-share, dinner and breakfast included. For adventures further afield, check out escapetonepal.com. ditto to all this. Shivapuri Heights Cottage is an oasis. When I arrived at Shivapuri Heights Cottages I knew I had at last found Shangra-La!